In Ladakh, there are multiple mountainous peaks above 6,000 meters, yet, even though it’s hard to believe, it doesn’t hold any world altitude record. 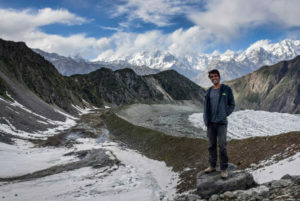 The highest peaks stand in Pakistan and Nepal. However, this Indian-Tibetan northern region has another world altitude world record: the highest motorable road in the world, Khardung La. Khardung La is a transited road located at 5,600 meters (or 16,000 feet) above sea level. By transited I mean that motorbikes, cars and even heavy trucks drive along it. 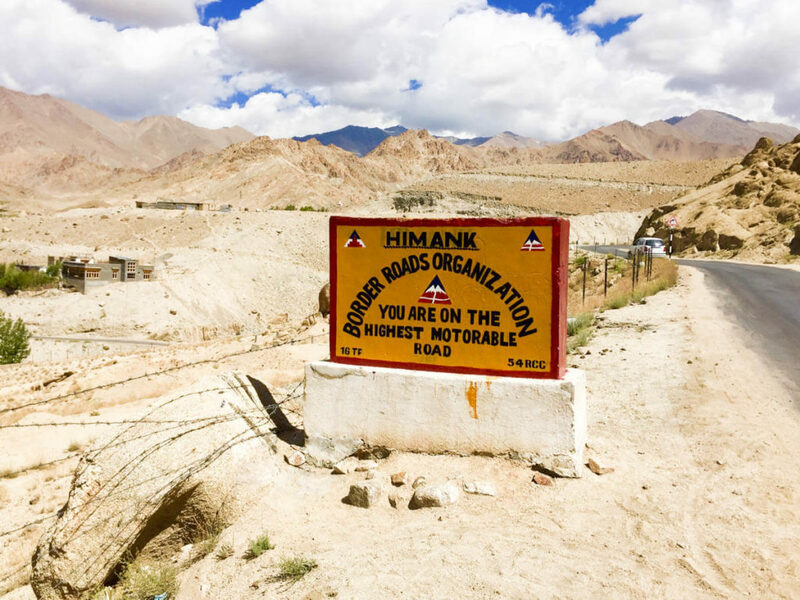 The world’s highest road is located around 40km from Leh, the capital of Ladakh, one of the 3 provinces of the northern Indian state of Jammu & Kashmir. 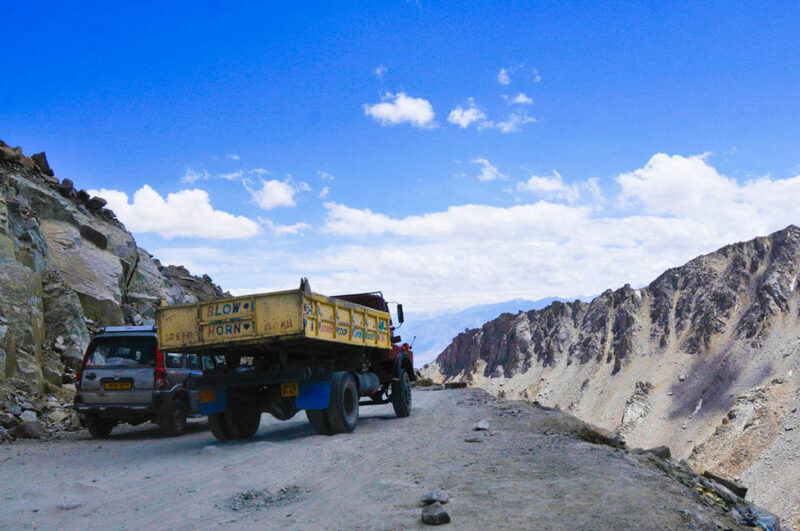 The pass was officially opened to vehicles in 1988 and serves as a connection between Leh, Nubra and Shyok valleys. Its strategic value is of high importance since it’s used to send supplies across Siachen glacier, a conflictive area for being on the border with Pakistan. 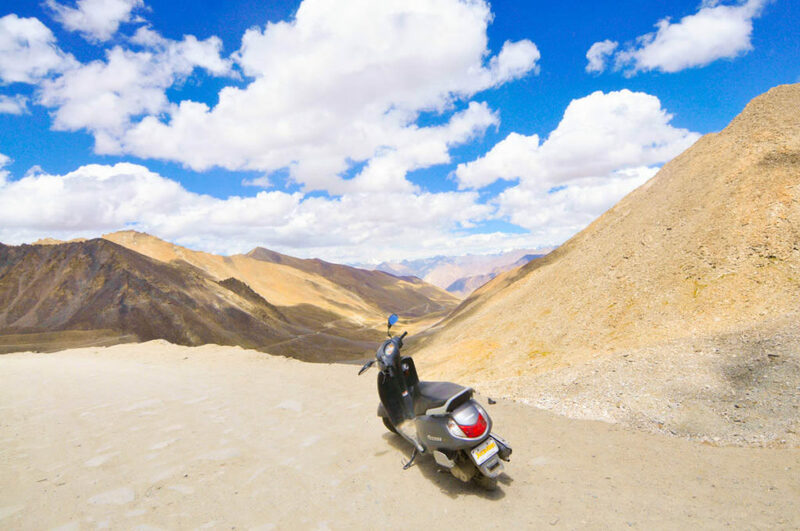 How is the journey to Khardung La pass? 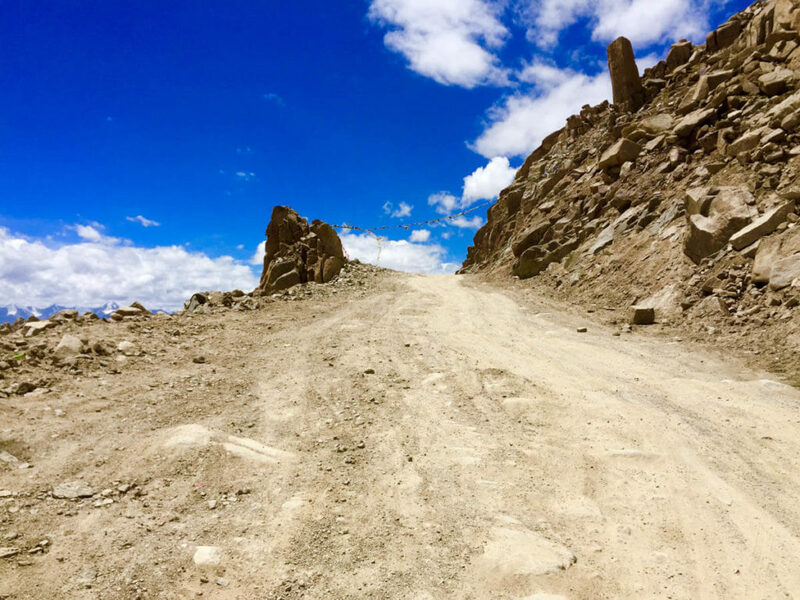 Why should someone drive to Khardung La? 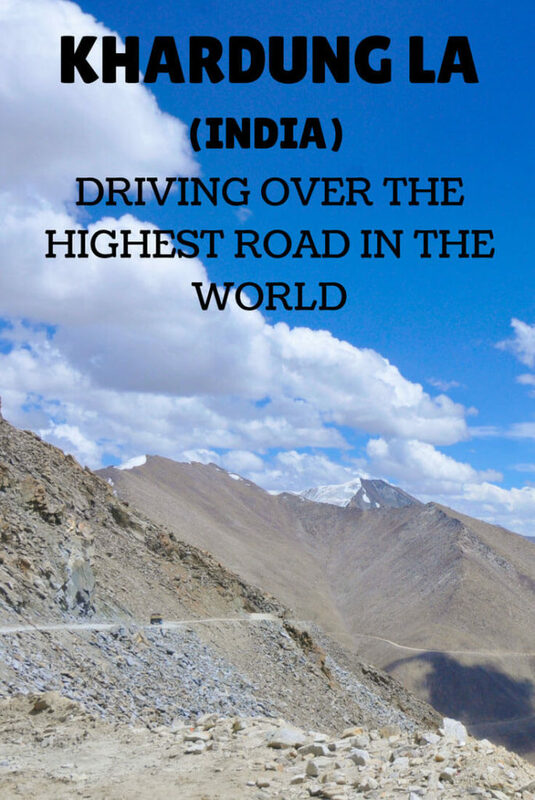 Yes, it’s the highest road in the world. Got it… But what else? Basically, I would say that people drive there for the fantastic views. 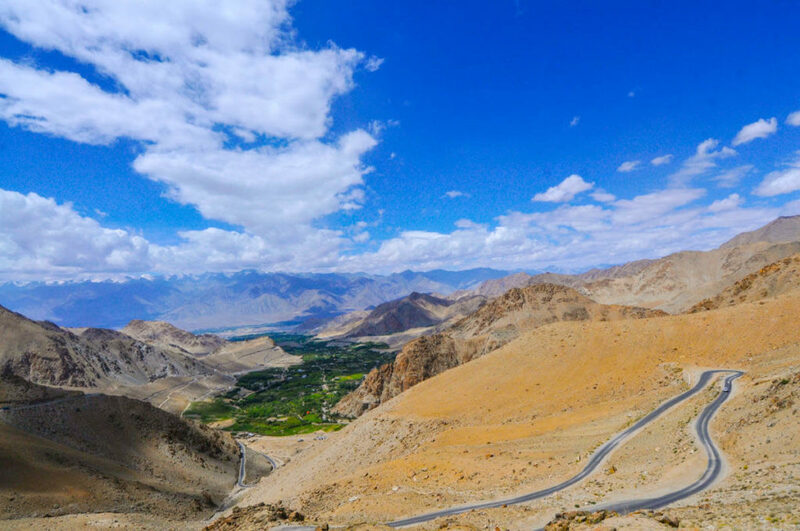 During most of the way, you get to see a beautiful panorama of the city of Leh from above, and while you keep on going up, this panorama gradually becomes a view of the Indo Valley and its surrounding stunning mountain range. Then suddenly, the Indo Valley becomes hidden by the same mountains you ascend. The landscape changes. There is neither vegetation nor civilization but an aggressive series of arid grey mountains that inspire the deepest feelings of desolation. When no cars pass by, you hear nothing. Temperatures drop and you start getting within Siachen Glacier boundaries. You are close to the top. Khardung La pass is sort of a different story. Normally, it gets very busy. Tourists, which in most cases are local Indians, take loads of group pictures. 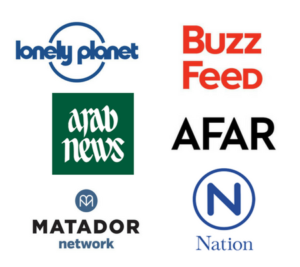 There are a few Westerners as well. There’s a cafe which serves coffee, tea, momos and instant noodles. There is a tiny hospital and a small souvenir shop. Everything claims to be the tallest thing in the world. ”Attention, due to the high altitude, we highly recommend you not to remain here for more than 20 minutes. Otherwise, you’ll get sick”. They were right. 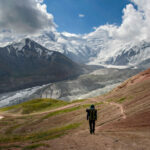 Going from 3,500 m up to 5,600 in only a few hours is enough to experience a mild headache. I stayed at on top for almost one hour and I got it. But it’s nothing much to be worried about. When you come down it quickly goes away. After the pass, the road descends directly to Nubra Valley, located at 80 km. You can either continue, or you may return to Leh. Getting there is fairly easy. In Leh, you can rent any kind of vehicle and go on your own. You can rent from a regular small car to an to an ORV (off-road vehicle) or a big motorbike. If you wish to make it more adventurous, you can also go on a small scooter. I decided to go on a small scooter because it was really cheap but, to be honest, it was not a very good idea. The road is extremely steep and on some parts, I could hardly drive over 10km/h. Besides that, from halfway onwards, the road is unpaved and in very poor condition. On several occasions, I had to get down and push because the scooter didn’t have enough power. On top of that, trucks raise dust all along the way and expel black smoke through their exhaust pipes. Get a permit: Note that you need a special permit to drive on this road. You can get it at any trekking agency in Leh. It takes maximum one day and costs 500 rupees. 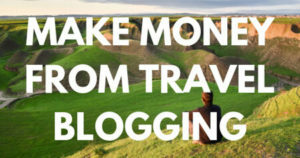 Buy a mask: If you travel by motorbike, I think that buying a mask is a must. You can find them in Leh for cheap. You will avoid swallowing the equivalent of 800 cigarettes. Trucks are old and unmaintained. They continuously spew out black smoke and raise dust all along their way. Transport: You can rent any sort of vehicle on your own. A scooter costs around 800 rupees a day ($12). A big motorbike costs 1,800 rupees a day ($26). There are many agencies that can take you with their ORV as well. 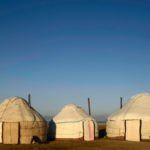 Alternatively, all of them offer a shared tour service, which means that you can split the cost between other tourists. Fill your gas tank: There aren’t gas stations on the way to the pass. Remember to fill your tank. 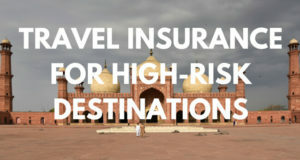 Solar protection: If you travel by bike, don’t forget to use sun protection. The higher you go, the nearer you are to the sun and at that altitude, sun rays are more harmful. If you don’t have solar protection, just cover yourself up with clothing. Altitude sickness: Getting altitude sickness at Khardung La pass is a common issue. If you don’t want to experience it, just try to leave quickly or have one Diamox before going up. However, if you get a headache, it will quickly go away once you start going down. Wow, this is an incredible road. Your problems with the scooter may have been frustrating at the time but they make for a good story! 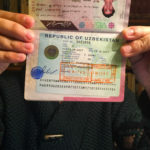 Congratulations on making it safely. What a adventure!!! and a worlds highest road adventure as well. Would be very happy to ticket that off my bucket list. So awesome that you got to visit Ladakh- it’s high on my list of must-see places!! And yay, a world record! Wow that sounds a great road trip adventure along the highest road. And stunning views too. I was not aware of Khardung La pass. Leh, Ladhak is one of my favorite place and I have some plans this year to visit the same. 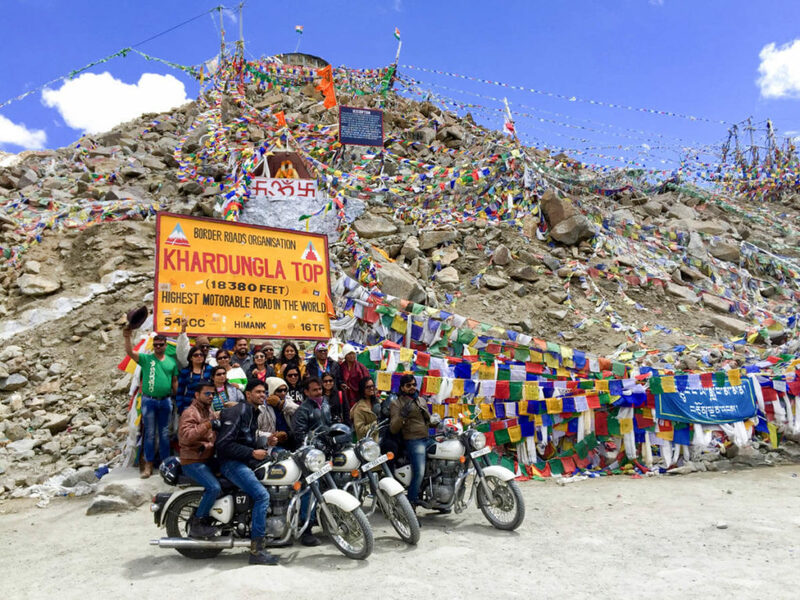 Thanks for sharing about Khardung La pass and information about it like passes requirement etc. Never thought that there is a highest road, but considering there are all types of world records, that is no surprise! I can see why people will choose it – the views are simply stunning! 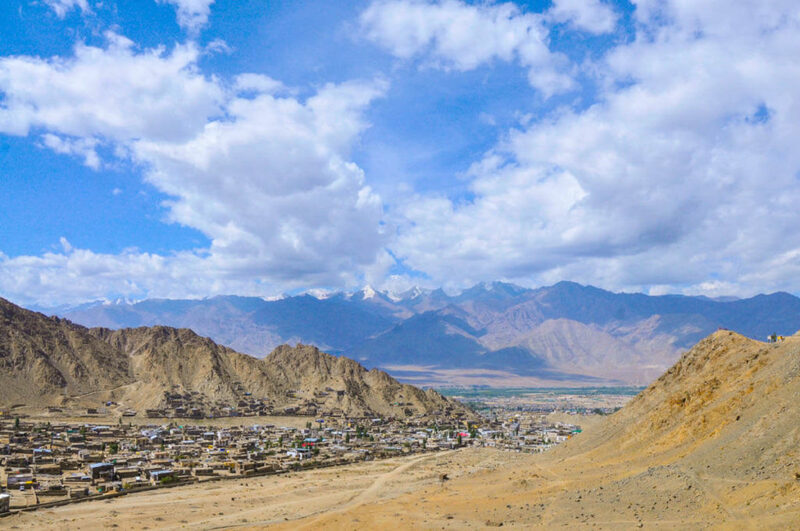 The city of Leh from above and the valley are a great panorama to have while driving. That is the best place to be as a biker. Almost Indian bikers have conquered Ladakh. What a fantastic experience! You are totally crazy doing that with a scooter though. The views from up there are amazing!